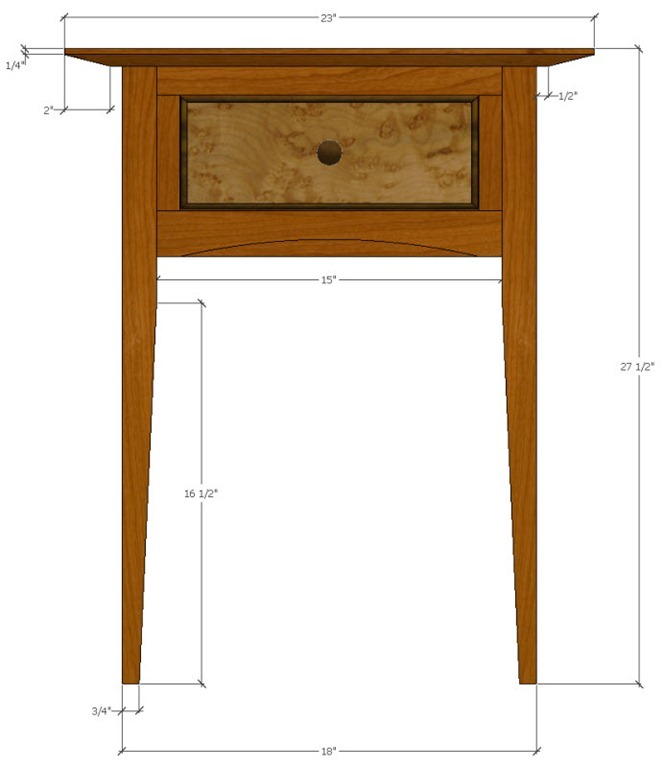 One of my Beginner’s SketchUp students, upon finishing the course, decided to build the Bedside Table I used as the learning vehicle in the video series. 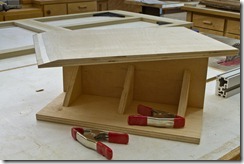 He wrote and asked for advice on a safe way to cut the top’s bevels. I thought this might be of general interest. So here is one of many approaches; and it is a safe one. Click on the picture at left to enlarge it. You will notice that the table top is 3/4” thick, begins to bevel on all sides 1/4” down from the top. The bevel is 2” wide. This works out to about 14 degrees. The table top is 18 1/2” by 23” with the grain running in the long dimension. I chose to cut the bevels on my table saw and clean them up with a hand plane. Finishing them with a hand plane is particularly necessary with cherry because it burns so easily. More on that in a moment. 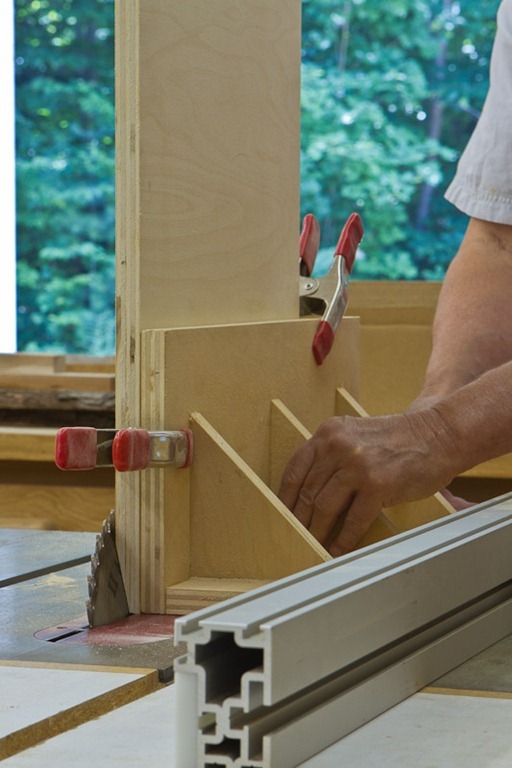 To cut the bevels on a table saw you need to set the blade for 14 degrees (you can’t set it for 76 degrees) and hold the top in a vertical plane as you cut. The fixture at right is simple and safe. It is made from scrap plywood. 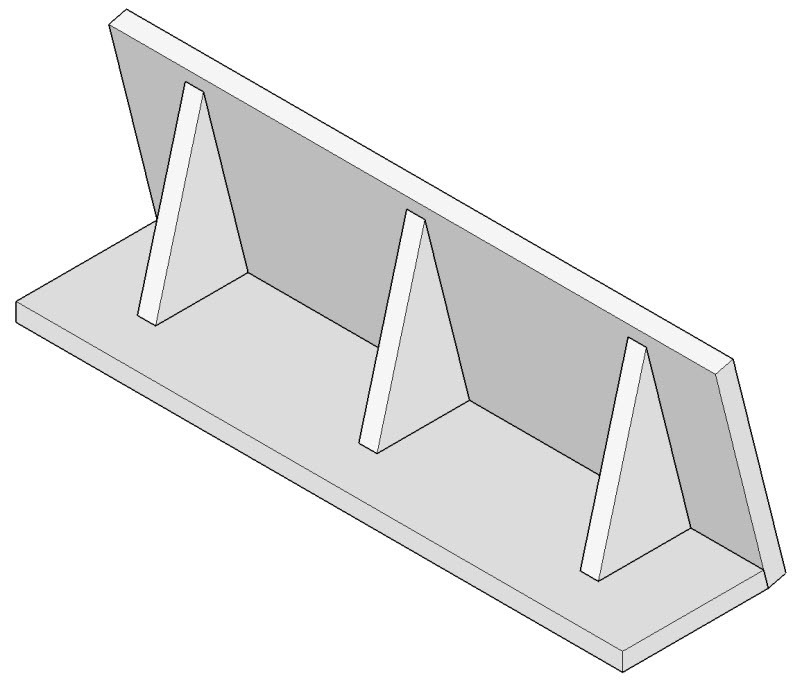 The important features are: the vertical and horizontal members must be perpendicular; the horizontal member must be the same width along its length; the vertical member should be tall enough to support the size table top you intend to cut; and the length of the horizontal and vertical members must be a little longer than the width or depth of the table top you intend to bevel. 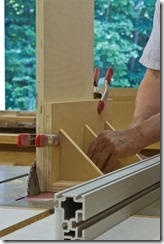 When assembling it keep the vertical member in front of the horizontal member to provide a perfectly flat front plane. Make the braces large enough to firmly support the members and also allow you to use them as handle to push the fixture along. Notice in the picture at left that I have set the saw blade for 14 degrees. (You can gauge 14 degrees with your eyes, right?) Also notice I had to remove the blade stiffener to get enough height on the blade, and my zero clearance insert. The clamps I used here I used for expediency sake. If this were a real cut on a real top I would have used Bessey Tradesmen’s Bar Clamps. They have two advantages. First they are stronger and clamp tighter. Second, they have clearance and allow you to reach further in from the edge. This is important, because all tops bow slightly, however slight. You may not notice it, but as you will see in a moment even an unnoticeable bow will show up as a curved bevel. 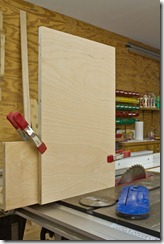 Get you clamps as close to the blade as safely possible; dry run a pass past the blade to be sure they will clear it. Set the fence so that the bevel begins 1/4” down from the top face (the top face is the surface that is against the fixture). With you hands on the supports hold the fixture up against the fence and slide the top through the blade. Be sure to keep your arm high and to the support side of the vertical member. Push the fixture and the top all the way through. DO NOT try to pull the fixture back! Turn the saw off and set up for the next cut. The piece I am cutting here is scrap plywood. I couldn’t waste precious cherry on an demonstration But if it were cherry I would try to push it through as fast as safely possible to avoid burning. However, it is almost impossible to avoid all burning, and the saw blade leaves machine marks too. So get out you trusty block plan or smoother and clean it up. Remember my comment about good clamps and keeping them tight and as close to the blade as is safe? Look at the finished bevel at left. This piece of plywood was quite flat but still produced a curved looking bevel. Fear not. It looks worse than it actually is, largely due to the parallel lines of a plywood cross section. It makes the curve look worse than is real. 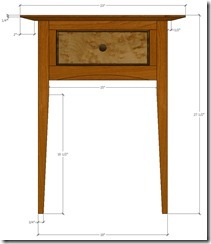 And your real piece will have curvy grain or end grain and it tend to hide the curve. Still, pay attention getting the clamping right, and pay particular attention to making sure any clamps you use clear the blade. If you are going to do a lot of beveled tops, all of the same angle, you might want to consider a fixture which is itself beveled, such as that shown right. The advantage here is that you don’t have to tilt the saw blade, remove the stiffener and the zero clearance insert. Nor do you have to recalibrate your saw blade to 90 degrees when you are done. The disadvantage with this fixture is that the angle is fixed. But I am sure you could design a mechanism that would be adjustable. In the second, third and fourth pictures above you can easily see that my cabinet saw is right tilting, that is the blade tilts to the right. I have to move my fence to the left side, which means I also have to change the side the fence attaches to the locking mechanism. Not a problem if you have a Biesemeyer fence. 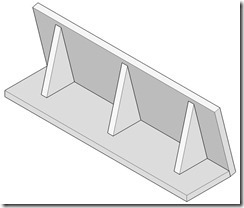 Also, the left side of the blade has a short table which limits the horizontal member’s width. 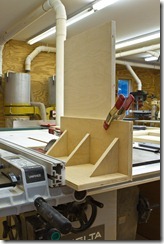 Another reason for building the fixture with a built in angle. That would avoid the fence changes and I could then work on the right side of the blade where the table is wide. The fixture itself doesn’t care which side of the blade it is used on. If your saw tilts left you have no such problems. If it tilts right, like mine, I highly recommend the fixture with the built in angle. I started out by claiming this to be a safe approach to beveling a top. It is, provided you follow normal shop safety procedures. If you don’t then there is no approach that is safe. This fixture keeps you hands and arms a safe distance from the saw blade. 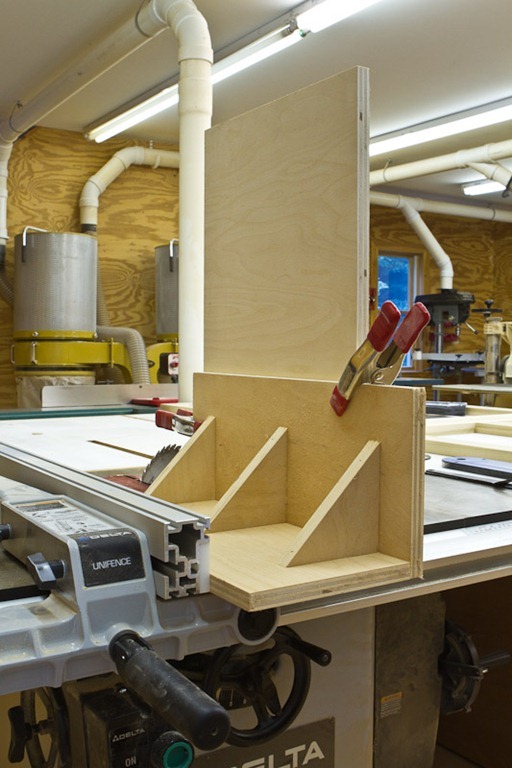 Each cut simply requires turning the top and re-clamping. Safe beveling!